Bacon has been appearing lately in all sorts of food items where one might not expect it, and where it probably shouldn’t be. There are bacon flavoured cupcakes, candy canes, ice cream, coffee, vodka, and even toothpaste (which I know isn’t actually a food item). But now bacon has moved beyond the food realm and entered the world of divination. 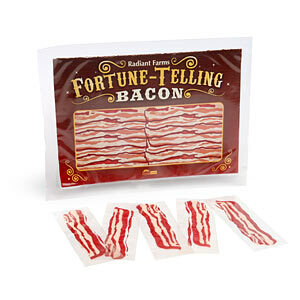 That’s right, Fortune Telling Bacon. Like its cousin, the Fortune Teller Fish, the oracle bacon communicates its message by squirming around in the palm of your hand. Unlike the fish, however, which focuses on questions of love, the bacon focuses more on questions of bacon preparation (though the answers, of course, can be interpreted any way you want). I’m not sure how useful a divinatory tool the Radiant Farms Fortune Telling Bacon really is, but as a mystically oriented vegetarian, it’s far more attractive to me than bacon flavoured coffee. And I like that ‘Canadian’ is one of the answers. You are currently reading Radiant Farms Fortune Telling Bacon at The Tarot Room.